This tutorial exercise puts the user in a real layer-based design session, where the user will be guided through creating a real world layered graphic using layers. The user will be shown various tricks and techniques, but will also be given room to explore and experiment with a view to make them find the techniques that they are most comfortable with. This tutorial assumes you are conversant with the concept of layers. If not, please read the section on Introduction to Layers first. This is what we want to draw. Looks complicated, huh? Don't worry, it's actually easier than it looks. Just follow the instructions and you'll see. Select new image from the menu and create a 300 x 300 pixel graphic. Select new layer and add a new layer of the same dimensions. Set the new layer's background to transparent and black. Select this new layer and draw a black circle on it using the shape tool as shown below. From the layers panel, set this layer to Alpha Protected. This ensures that any drawing done to this layer does not affect the transparency; so it will always remain round. Add another layer, 300 x 300. Using the shape tool, draw a white ellipse on the new layer. Now, we need to rotate this ellipse. 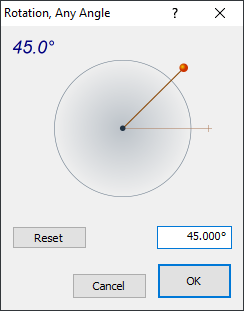 Using the transforms menu, select rotate/arbitrary angle. Rotate the layer anti-clockwise by about 45�. Position appropriately after rotation. Now, we are going to use one of the newer tools, in this case the elliptical transparency gradient option of the Full-page Gradients tool . Select this tool. Set alpha 1 to about 64 and alpha 2 to 255. Apply as shown. Adjust to taste. Since we left the background layer untouched and below everything else, we can fidget with it as we wish. You can decorate it using the gradient tools. I used two GT Shape rectangles in vertical mode for this: black, 0, 255 from the top, and pale blue, 0, 255, for the bottom part. Try doing it. Afterwards, I used GT Shape ellipse, black, 0, 255 to create the shadow. Now, you can add some sparkle to it... just insert yet another layer and use the GT Shape tool in "Sparkle" mode to do it. Remember to use white, white, alpha 0 and alpha 255. Done! As you can see, that wasn't so tough! See how easy it is to create stuff when you use layers appropriately?